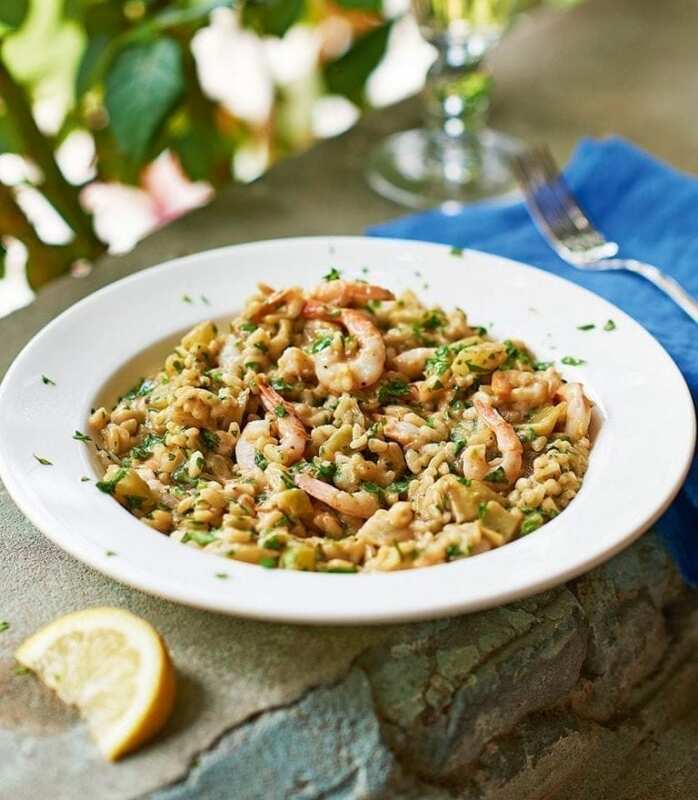 Italian cookery expert Sophie Baimbridge shares her recipe for an authentic Italian seafood risotto. Peel the prawns and put the shells and heads in a saucepan with the vermouth and stock. Bring to the boil; simmer for 10-15 minutes. Strain into a jug (discard the shells and heads) to produce about 750ml stock. Return to the pan and keep warm on the hob. Melt the butter in a heavy-based saucepan over a low-medium heat, then fry the onion gently for 5 minutes without colouring, stirring. Add the fennel and garlic and fry for 5 minutes, stirring occasionally. Season with salt and pepper. Add the rice and cook, stirring occasionally, for a further 3 minutes to toast the rice in the butter. Stir in a ladleful of the stock and cook at a fast simmer, stirring constantly. As the rice cooks it will slowly release starch, giving the dish its creamy consistency. When the stock has been absorbed, stir in another ladleful. Continue like this for about 20 minutes or until the rice is al dente. When you have added about three-quarters of the stock, add the prawns. Add a little more stock if needed – each time you cook risotto it will need a different amount of stock – until the prawns are pink and cooked and the rice is al dente. Sprinkle over the parsley to serve. Toasting risotto rice in butter before adding stock gives it a nutty taste and helps keep the grains firm when cooking.